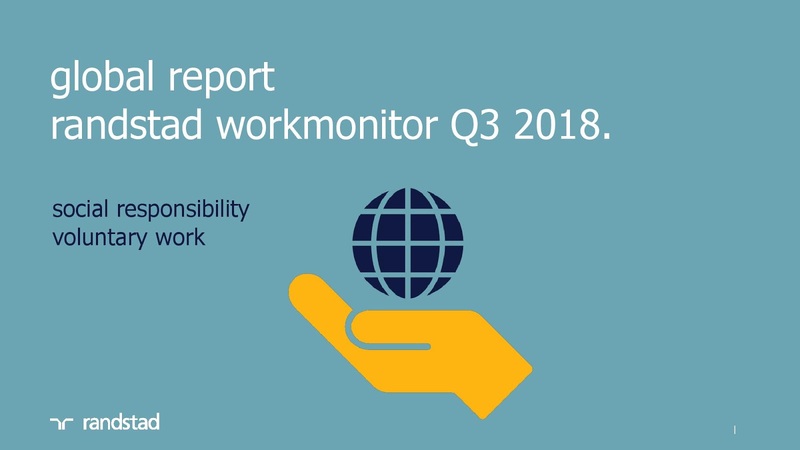 Kuala Lumpur, Malaysia, October 2, 2018 - According to the latest Randstad Workmonitor study, 82 per cent of employees and job seekers in Malaysia consider it important to contribute to the society by doing unpaid voluntary work, but only 49 per cent actively commit to volunteering activities outside of their working hours. However, 82 per cent of the respondents would be keen to volunteer if they were given paid time off by their employers. Employees in Malaysia do not have much choice about which charitable organisation they can volunteer at, with only 40 per cent of the respondents saying that they were given paid time off to volunteer for a cause or charitable organisation of their own choice. impact of CSR programmes on the malaysian workforce. At least eight in 10 employees and job seekers in Malaysia surveyed (84 per cent) said that they will only want to work for a company that has a strong corporate social responsibility programme. When looking for a job, 83 per cent said that it is important to them that the company they are applying to participates in a charitable cause or philanthropic initiative. inclusion and diversity important to malaysian employees. Employees based in Malaysia are firm believers of diversity at the workplace, with 93 per cent saying that it is very important that all opportunities should be presented based on the individual’s ability to perform the role. This same group of respondents also agreed that job opportunities should be made attainable to the labour market regardless of the individual’s physical ability, age, gender, ethnicity, race, sexual orientation and religion. randstad malaysia: mobility index Q3 2018. Overall, the Mobility Index is moderate in Malaysia in quarter three 2018. The Mobility Index tracks the employee confidence and captures the likelihood of an employee changing jobs within the next six months as well as provides a comprehensive understanding of sentiments and trends in the labour market. Compared to the previous quarter, job satisfaction has decreased five points to 74 per cent in quarter three this year. The percentage of respondents who are actively looking for a job had also dipped from 16.79 per cent to 15.8 per cent in quarter three.